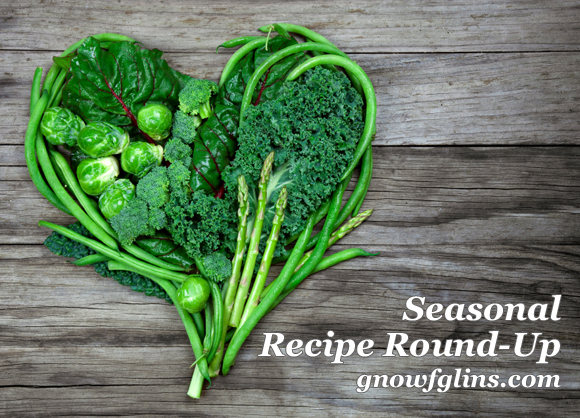 Welcome to another Seasonal Recipe Round-Up! This time we're featuring tomatoes (and next time is squash — see schedule below). I'm sharing my tips about tomatoes and you can participate by sharing your own tips and/or recipes in the comments. The world enjoys hundreds of varieties of tomatoes — not all red. You'll find reds, yes, but also yellows, oranges, purples, greens, striped and speckled. 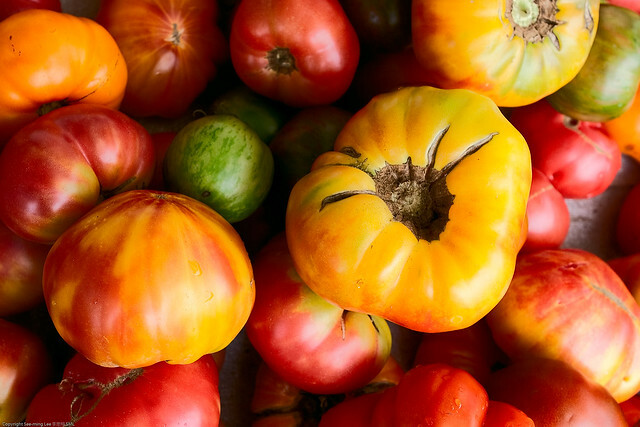 Heirloom tomatoes are gorgeous — and gloriously shaped, too! Deep colors are the name of the game. Firm, not mushy. Juicy — though paste tomatoes are more “meaty” and less juice and that makes them excellent for preserving. One thing I learned when I put in my first garden was that tomatoes are best kept at room temperature for fresh eating. Storing them in the refrigerator causes you to lose tons of flavor! Add to soups, or make fragrant, fresh tomato sauce: saute onions and garlic, add chopped tomatoes and chopped fresh herbs, simmer, then season to taste with sea salt and pepper. In more recent times, I choose to dehydrate excess tomatoes. Simply slice 1/4″ and dry under 115 degrees Fahrenheit until dry. Then vac seal and/or store in cool and dry location. They can be soaked in water and blended to make sauce or paste (depending on how much water you use). Or, you can powder them when dry to store in even smaller spaces. Here are some of the tomato recipes I've shared on this blog. 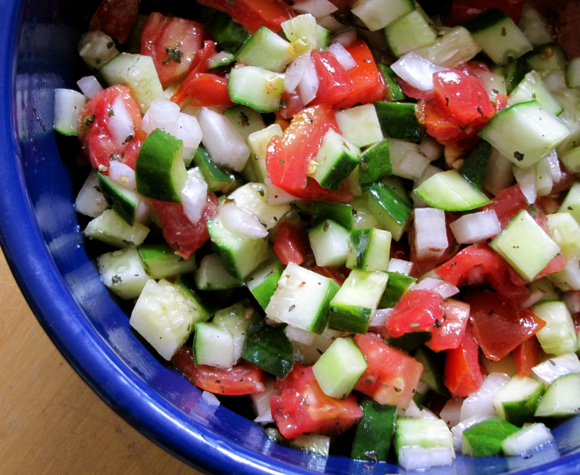 Mediterranean Cucumber-Tomato-Mint Salad. I make this a lot during the summer when tomatoes and cucumbers are in season. 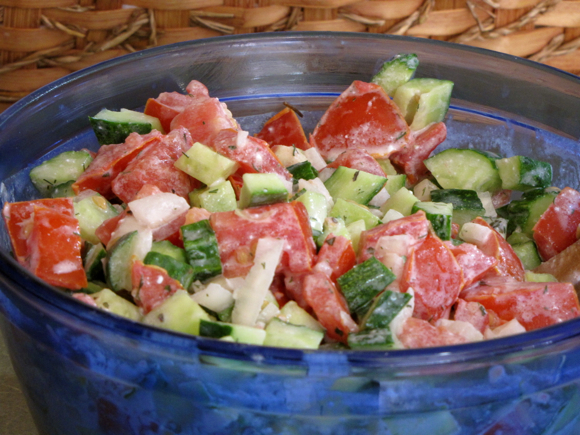 Cucumber-Tomato Salad with Kefir (or Yogurt). Same idea as above, but toss the salad in yogurt or kefir instead of olive oil and lemon juice. Season with dill or basil, sea salt and pepper. Tomato Sandwiches! My sourdough pocket bread comes from the Sourdough eCourse or Sourdough A to Z eBook. Load the halves up with hummus or kefir/yogurt cheese and cucumbers and tomatoes. 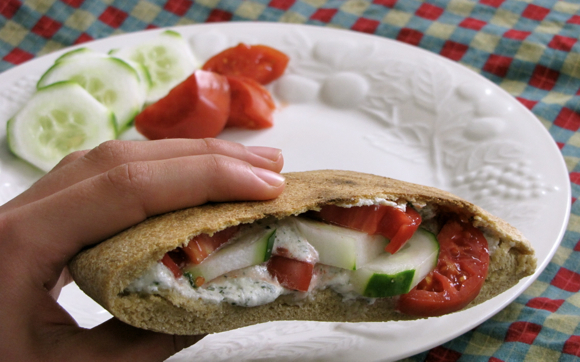 Or what about my mom's award-winning falafel, tahini sauce, tomatoes, and cucumbers? Any way you fill them, they're delicious! 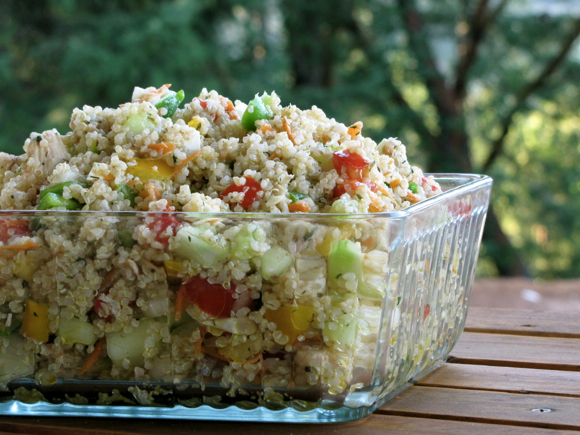 Quinoa Garden Salad. 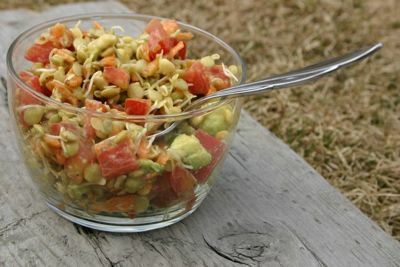 Using the dump method (dump all ingredients in bowl and toss), this salad lets you use everything your garden (or market) produces! 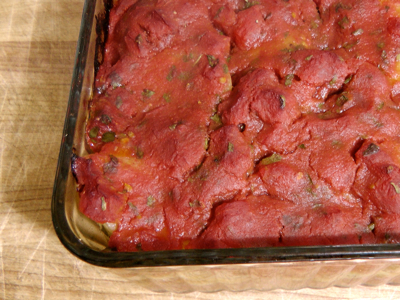 Arabic Meatloaf. This meatloaf, kiftet batatta (meatloaf with potatoes), is topped with potatoes and tomato sauce for an easy main dish and features spring parsley. 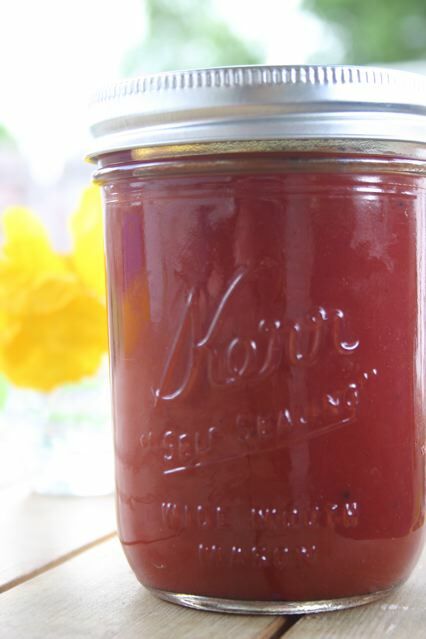 Lacto-Fermented Ketchup (uses tomato paste). Also featured in my book, The Complete Idiot's Guide to Fermenting Foods and in my online class in Lacto-Fermentation. Nikki's Lacto-Fermented Roma Fresca. Use Roma Fresca on top of steaks, fish, or chicken for a mouth watering combination. Or, with chips as a mild salsa. 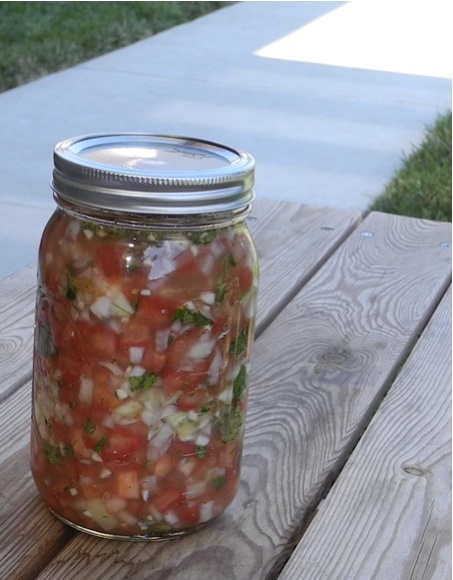 You'll find more fermented salsa recipes in my book, The Complete Idiot's Guide to Fermenting Foods and in my online class in Lacto-Fermentation. 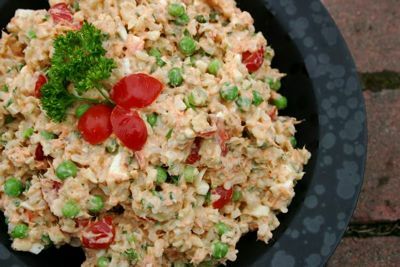 Smoked Salmon and Rice Salad. Another winner from Erin. Her recipes are lovely, aren't they? Share Your Tomato Recipes and Tips! Remember, the round-ups don't close — you can add your recipes at any time. And I hope you will! Come back on Friday, August 31 for our squash (including zucchini) link-up in the Seasonal Recipe Round-Up. We’ve had them for a month! 🙂 Mmm so good. But the family of deer plaguing our garden agree so we don’t get many tomatoes. I’ve been making tomato basil soup, marinara and bolognese sauce almost non stop for the past 6 weeks… With many more weeks to come, so thanks for the suggestions! Made the Mediterranean Cucumber Tomato Mint salad. It was wonderful. I often make greek salad just never thought of using mint. Thank you. Hi! I posted my GAPS pizza. 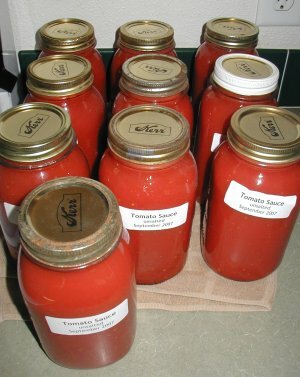 a yummy way to add homemade tomato sauce to!